NIMS, the University of Tokyo and Hiroshima University have jointly evaluated the economic efficiency of hydrogen production systems combining photovoltaic power generation and rechargeable batteries. They also estimated technology levels necessary for the systems to produce hydrogen at a globally competitive cost. The results may provide vital guidelines for advancing intermittent renewable power generation systems as a main power source of the country. Scientists report obstacles in the effort to increase renewable power generation, such as unstable power generation and low annual capacity ratio. Specific examples include Japanese power companies suspending acceptance of applications from renewable energy suppliers in September 2014 and Kyushu Electric Power Company controlling output power suppression of solar power generation in October 2018. To address these issues, various organizations have been studying systems capable of storing excess electricity in rechargeable batteries and power-to-gas (P2G) systems capable of producing hydrogen using renewable electricity and storing and supplying produced hydrogen. However, most of these systems were found to be expensive to operate, undermining the mass implementation of economically feasible power generation technology driven by domestic renewable energy. The joint research team designed an integrated system (see figure) capable of adjusting the amount of battery charge/discharge and the amount of electrolysis hydrogen production in relation to the amount of solar power generated. The team then evaluated the economic feasibility of the system. They identified technology levels necessary for the system to produce hydrogen at low cost through a comprehensive analysis of factors including rechargeable battery and electrolyzer capacities, while considering future technological advancements. For example, rechargeable batteries that can discharge only at a low rate but can be produced economically are expected to become available by around 2030. The team estimated that integration of these batteries will enable the system operated in Japan to produce hydrogen at a globally competitive cost of 17 to 27 yen per cubic meter. In future studies, the team plans to determine component technology levels required for proposed systems and set R&D target values to achieve these levels. 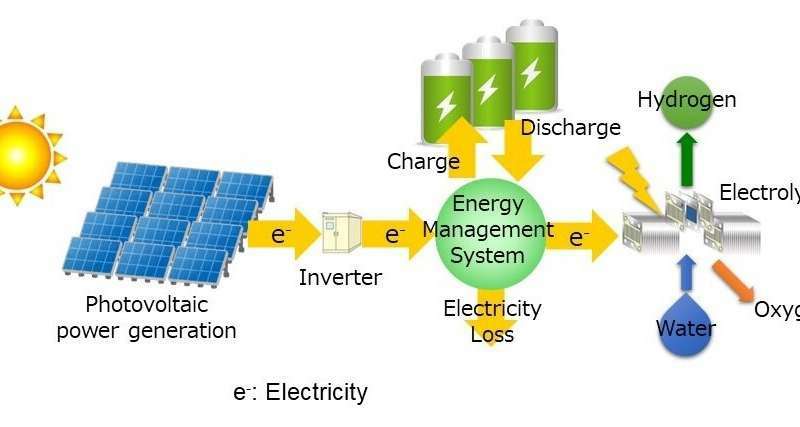 The team will also investigate the system feasibility of renewable power generation systems under output suppression control or a restricted electricity power grid connection in order to design a prototype system.